The economy stinks. Everyone knows that. And with rising gas prices goes rising food costs. One thing that has been odd in the middle of all of these price increases and package size decreases is that, in my area at least, whole chicken prices have gone back down to where they were a couple of years ago. It seems like it’s been so long since you could cook an entire chicken for under $5, but miracle of miracles that’s what I’ve been doing a lot of lately. Now these have been standard chicken farm chickens, not free range, antibiotic free or anything. I did notice, however, that the package said “natural” on the label. I had to smile at that one. Good to know that they aren’t packaging artificial chickens just yet. I love the prices, but chicken is chicken is chicken, so finding interesting ways to use it has been challenging. We had head colds when I was trying to figure out what to do with this particular bird, so coating it with ginger and letting the aroma float through the house didn’t seem like a bad idea. 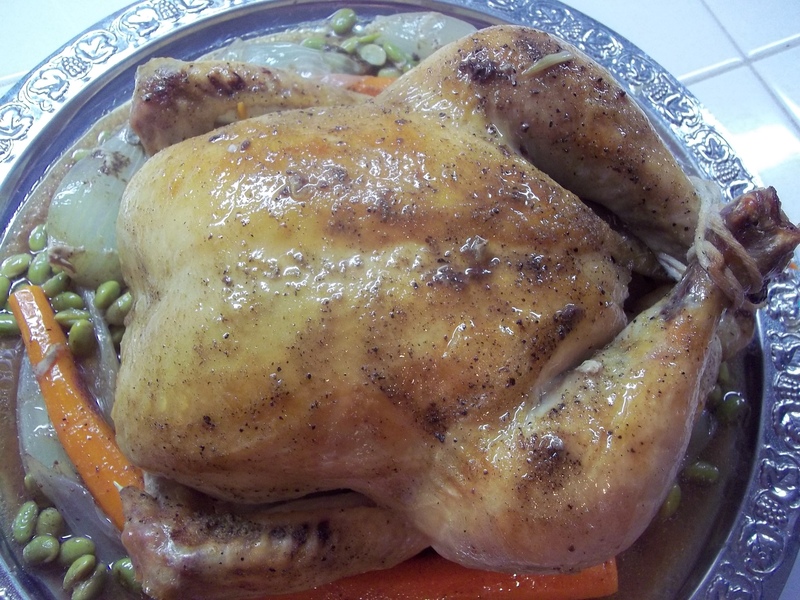 I was concerned that the ground ginger would be a little strong in the amount that I was using, but it was really mellow when the chicken was done roasting and the vegetables underneath were soft and very flavorful. 3 c. firm vegetables such as onions, carrots, celery, etc. Wash and dry the chicken. Tie the feet together and tuck the wing tips under the back to prevent them from drying out. Season the chicken with salt, pepper, and ginger. Lay the vegetables in the bottom of a deep roasting pan. Place the chicken on top of the vegetables. Cover the the bird. Roast in the oven for 30 minutes at 350 F. Reduce heat to 250 and continue cooking for 1 hour. Bring the temperature back up to 350 and remove the cover from the chicken. Allow it to roast for an additional 45 minutes, basting occasionally with the pan juices. Allow the chicken to rest before serving so that it will retain its juices.